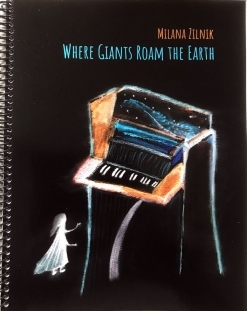 Where Giants Roam the Earth is the companion sheet music book for Milana Zilnik’s 2018 solo piano album by the same name. All fourteen pieces from the album are included, transcribed to match the recordings as closely as possible. The music is varied in style, mood, and genre and since much of the recording was improvised, the rhythms can be quite complicated. In other words, this is not an “easy piano” collection. I would recommend this book to pianists at an early-advanced playing level and higher. The books are printed on a bright white paper stock and are available with spiral or “perfect” binding. Spacing is good and there are lots of dynamics and playing suggestions/instructions to help the pianist understand how to express the music in a way similar to how it was recorded. 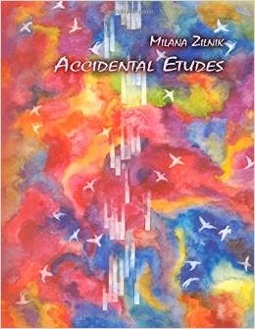 The front cover is an expanded version of the dramatic CD album cover, and the back cover has a lovely photo of Ms. Zilnik. The limited-edition books are available from Bandcamp and Amazon, and Milana will sign any copies purchased from Bandcamp. Some of the pieces are available individually from Sheet Music Plus.